The Planet Waves Pedal Board Kit is the ultimate solution for custom-wiring your pedal board or rack gear. Inferior patch cables can cause signal loss and undesirable coloration to your sound. Planet Waves plugs and cables are specially designed to provide the most accurate and reliable reproduction of your sound from guitar to amp and all points between. Includes 10' of cable, 10 right-angle plugs and a mini cable cutter. 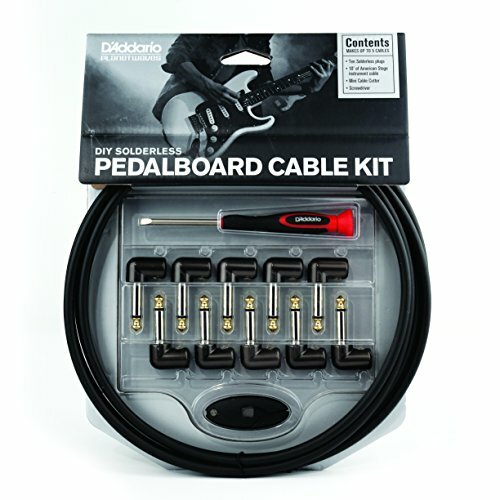 - Solderless plugs connect to cable in seconds, creating exact required lengths easily. - Road-tested plug connections hold up even the toughest gigging situaiton. - 24k gold-plated plugs for improved signal flow and corrosion resistance. - Double insulated cable employs braided copper shield and metalized polyester foil inner shield for 100% shielding coverage. If you have any questions about this product by D'Addario Woodwinds, contact us by completing and submitting the form below. If you are looking for a specif part number, please include it with your message.